Senior Constable – appointed 1 August 1863? On Tuesday, the 16th June, a magisterial inquiry was held before Thomas H. Neale. P.M., touching the death of a man whose body was found near the Liddleton Estate House, within three miles from Hartley, and from the statements of certain witnesses, as well as the sworn testimony of Henry Allworth Ledger, constable John Bentley, and a lad named Thomas Muldoon, it transpired that on last Saturday fortnight Ledger heard, at night, cries proceeding from near his residence, but why did he not go out and see who it was, and why the person was in distress, did not transpire, but on the 15th a dead body was found within 300 yards of the Liddleton House, and a more horrible spectacle was never beheld in the solitude of the Australian bush. Married to Johanna SHEA from Kilkenny, Ireland. Constable John Bentley stationed at Rockley, NSW. The above article, dated 4 July 1863, conflicts with NSW State Archives & Records which state that John BENTLEY, # 1488, was appointed to the Police as of 10 September 1864. The above article is more likely to be linked with John BENTLEY # 613. I believe that the grave, in the above photo, is correct for John BENTLEY, Regd. # Q 1488. ( This John Bentley can’t be # 1488 as # 1488 was born in 1827. He & Johanna Shea had 10 children. Message: I have a descendant named John Bentley who was a mounted police officer stationed in Rockley in the late 1800s. NSW 1864-1874 including Rockley, Stuart Town & Hartley. 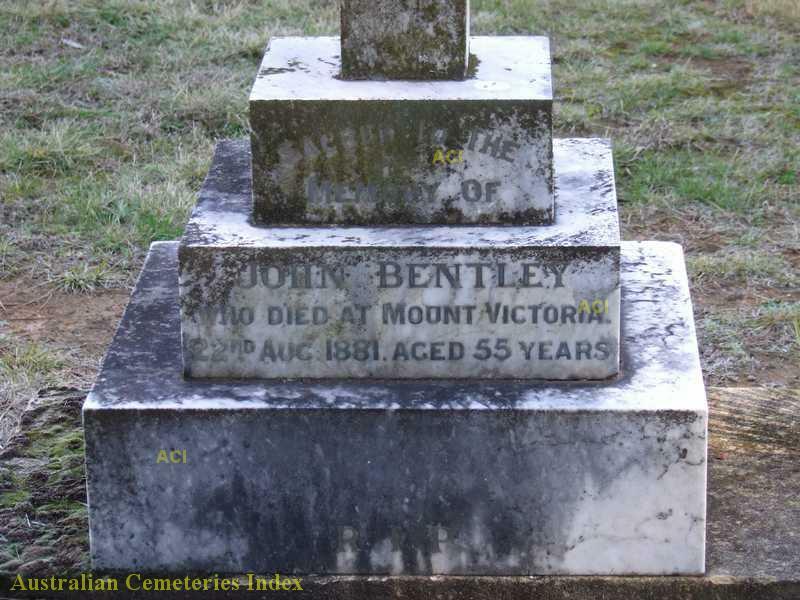 John died in 1881 at Mt Victoria NSW & is buried at Hartley. Johanna b 1838 Kilkenny Ireland died in 1918 & is buried in Blackheath. Are there any police records pertaining to my descendant mounted police officer John Bentley in NSW? PS I am also aware that John Bentley had also previously been a mounted police officer in South Australia from 1849- 1859. I have already obtained his police records from the South Australian Police Archives.